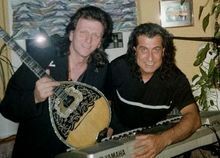 Als Christos und Christos gemeinsam das musikalische Reise führen das Duett"Hellenic Bouzouki Ensemble" feiert 15 Jahre grosse Erfolge.Viele,kleine und grosse,Auftritte im ganzem Land,mit griechischen Tanzabenden aber auch mit Auftritten in Festivals und Folkloreveranstaltungen. 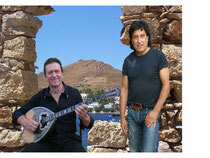 As a Christos and Christos jointly the musical trip the "duo Hellenic" celebrates 15 years. Many small and large successes entrances in the entire country with Greek Dance Nights however also with entrances in festivals and folklore organizations. With folklore of the mainland, the Greek islands, as well as a large repertoire of newly and old Greek music (Laika - Rebetika) the ensemble yet demanding international melody and pop songs in an impressive plays, without time limitation, music for singing along and gladly subsequently for you for dancing!! The two musician let arise in an attractive program vacation feeling and can experience you with the magic the Greek music! !!!!!!!! !Eleven you an unforgettable evening with Hellenic music of Bouzouki ensemble DUO HELLENIC Christos & Christos and let itself tempt float itself of the sounds of the Bouzouki and you jointly with us in the Greek vacation feeling.